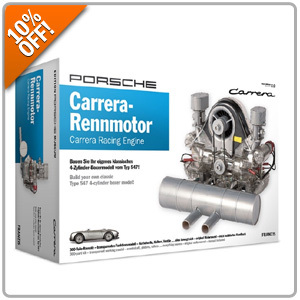 These have been a great hit among Porsche enthusiasts, and we're now offering 10% OFF on this wonderful 1/3 scale Carrera engine model. This engine model features a rotating display with working cams, spark plug and distributor, and cooling fan! Grab yours today and spend time bonding with family, or build it as a nice escape from daily life! Be sure to enter promo code ENG10 during Checkout. Last day to take advantage of savings. Promo ends tonight at 11:59pm PST.